There are a couple of things you may notice about this issue of Volume One. One you can’t miss: it’s a big ol’ holiday catalog for the Local Store (Volume One’s retail shop that just turned one year old!). View it online here. The catalog showcases many of the new items we have in for the first time this season (there are a lot of them), including a whole series of localized toddler and young’un t-shirts that we think are pretty fun. But more importantly, on pages 16-17 (online right here) you’ll see a message we put together reminding you to think about where you spend your money this holiday season, and how that simple choice can make a big difference in our community. It’s a message supported by a number of local businesses, and something you’re going to see from us in print and online for the rest of the holiday season. 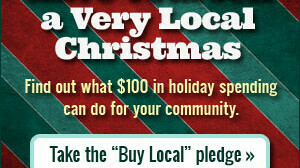 Essentially, it’s a holiday “buy local” campaign, not unlike many of the other initiatives you may have heard about in recent years like the 3/50 Project, Small Business Saturday, IndieBound, and many more. Those of you familiar with Volume One know the vast majority of the advertisers in our pages are local and independently owned businesses – so it’s no surprise we’d be a champion of this cause. But we’re far from the only local organization whose success is so closely tied to the success of other local businesses. We’re all closely connected in a variety of ways, and success for one can help lead to success for others, which can help lead to success for our entire community. So as you belly up to cash registers across the Chippewa Valley this holiday season, stop to think about the power you have to help nurture this positive chain of events, and choose to spend part of your holiday budget at locally owned retailers.